Physical model Or Statistical model? At first we want to make such a model only depending on physical tests with data derived from our experiments. The first step ,we need some data such as the force between the two molecules ,the structures of molecules ,the influent scale of different molecules ,some characters of our flowing cell culture and the endocellular matrix. We applied many physical approaches to build the model we should get. During such a period ,we have divide space into many cells called boxes, and different molecules occupying different numbers of boxes. But it is too hard to get the main equation which can characterize most of the features we can refer to. Even if we can build such an equation, there are enough reasons to deny our model. Maybe we got the wrong way to analyze life processes, which are so complicated that it confuses us. So we should seek another way to build the model. Swe can’t exactly describe the truth to predict all the changes, why not use the finite data to make a equation that can characterize a small scale of our model. So statistics provides us a good tool to build such a model. We also detect if different reporter would influence our data. Our experiments are discribled as follows. We describe factors which influences our final results as many parameters. These parameters are expected to include time, concentration of inducers, and the space. In terms of space ,we have other ideas to ignore it, for example using semipermeable membrane to isolate different cells to guarantee each kind of cell can be in the similar conditions as culturing it alone. Hence, there are only two influencing factors left now. So all we need to do is to characterize . 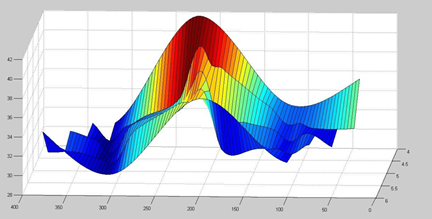 R instead of final result, we detect the fluorescence intensities of our system as the recorded result. T means the time we culture and induce the system. So we got future concentration as 100uM as the experimental concentration to detect the best time of our experiment. To make the model more exact similar experiment were made as follows to test if the model was right enough. This is not a good model which data are not so correspond with our first data. But the coincidence of the two threshold suggest such a truth that both the two model should be correct and it can be used to characterize some subset of the final equation. We would like to provide more data to build our model. Futuremore we substracted the scale of our total experimental time and add more groups of experiments to investigate the relationship among fluorescence intensities, time and concentration of inducers at the same time. 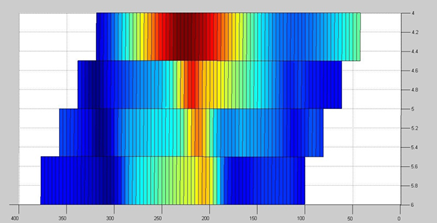 Parameter calculation and testing goodness of fit were made again. 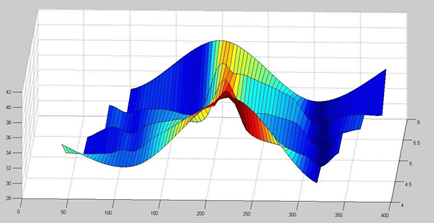 Then a 3D model was built with matlab. The picture of this model was shown as follows. But we don’t think any single equation could characterize the complicated geometric surface. And then we change our method to get another equation as follows. SSE -- The sum of squares due to error. This statistic measures the deviation of the responses from the fitted values of the responses. A value closer to 0 indicates a better fit. R-square -- The coefficient of multiple determination. This statistic measures how successful the fit is in explaining the variation of the data. A value closer to 1 indicates a better fit. Adjusted R-square -- The degree of freedom adjusted R-square. A value closer to 1 indicates a better fit. It is generally the best indicator of the fit quality when you add additional coefficients to your model. RMSE -- The root mean squared error. A value closer to 0 indicates a better fit. As you can see from the introduction section, there are some similarities among the three kinds of cells, if we can deduce one of those three model equations, predicting the final layout of our bacteria is going to be accessible.